Summary: By age sixteen, Rhine Ellery has four years left to live. She can thank modern science for this genetic time bomb. A botched effort to create a perfect race has left all males with a lifespan of 25 years, and females with a lifespan of 20 years. Geneticists are seeking a miracle antidote to restore the human race, desperate orphans crowd the population, crime and poverty have skyrocketed, and young girls are being kidnapped and sold as polygamous brides to bear more children. For a long time I heard great things about Wither, but for some reason I still didn't pick it up until recently. I don't know what I was waiting for! 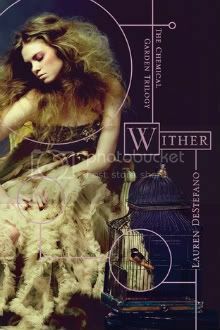 Wither is an original and compelling dystopian novel that had me intrigued at the very beginning with its premise but kept me reading for the characters. A genetic experiment gone awry resulted in all women dying at age 20 and men at 25. The first generation, the first attempt to make a perfect race, will live for a long time, but each subsequent generation suffers from early mortality. Because of this, young women are kidnapped or taken from orphanages and sold as brides to wealthy young men, in the hopes that a new generation will produce a cure. When Rhine is kidnapped, she and two other girls all become brides for the rich young Linden. Rhine immediately resents Linden and longs to escape and find her way back to her brother Rowan. Yet with Housemaster Vaughn controlling everything, escape seems improbable. As Rhine continues to search for an opportunity, she grows closer to her sister wives and to the servant Gabriel. And eventually Rhine comes to learn that not everything is as black and white as she thought. Even though dystopian novels seem to be filling the market, so many of them manage to stand out because of their excellent writing and compelling story or characters. And Wither was no exception. Even though there was not always much action in this book, I loved watching the different relationships develop. Rhine becomes friends with her sister wives, and I think that Jenna's strength was something to be admired. I think this strength helped Rhine as well, and it was touching to see the ways they could help each other. Then there was Gabriel, the servant that Rhine comes to like. I wish they had had more time to be together - they had some sweet moments and there is much more to be told here. Finally, there is Linden. I have to admit that I am intrigued by where his part of the story will go. He seems to be a victim as well and I cannot help but wonder what will happen if he ever learns the truth of everything. This book was tough to read at times because of the situation Rhine, Jenna, and Cecily found themselves in. I wasn't spared feeling for them at all, nor are we spared the evilness of the man that is Housemaster Vaughn. Wither is emotional to say the least. Because of that, although at times I wanted the plot to move forward a bit or wanted even more from the characters, I stayed completely invested in the story. Wither may have have the same action-driven story of other dystopians, but don't let that stop you from reading it. With Rhine close to her twentieth birthday and with Housemaster Vaughn being who he is, I can only imagine what is in store for Fever. The Chemical Garden will be a trilogy not to be missed!